There are so many great fabric sales going on out there. Cuts of Cotton, my sponsor has a fabulous 3 day sale going on, which i want to plug a little. BLACK FRIDAY | small business saturday | CYBER MONDAY SALE!! I am especially thankful that Cuts of Cotton believed in my new blog enough to advertise with us. I am combining Part 5 and Part 6 of How to Build Your Stash Without Breaking Your Budget. Why am I doing that? Because I cannot believe how many Black Friday and Cyber Monday fabric sales I am finding right in my inbox. I would rather share this information with you today, so you can take advantage of these great deals. I will be!! I generally have my main focal fabrics, which I know will be determining my colorway. Stephanie Ryan, a designer from Moda, has recently come out with a line of fabrics called Modern Roses, which I love. This link from Fabric.com shows the entire line; https://www.fabric.com/SearchResults2.aspx?Source=Header&SearchText=Modern+Roses&CategoryID=1d5f47dc-9991-4088-93f3-26a376046a5e. I know those large roses will be those focal fabrics. If I am going to use a boarder, and sometimes I don’t for a more modern look, I will choose fabrics that contrast with the main fabrics, because they are the star of the show. Boarder fabrics will often be a fabric that has more volume or brightness or less volume and brightness than those main fabrics. 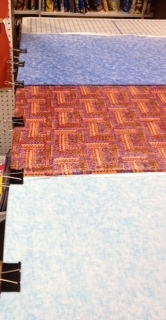 Sometimes they will be solids, because the quilting on them will really shine on that solid color. I choose binding fabrics that are not directional, because it is hard to make the seams line up for the continuous pattern look. 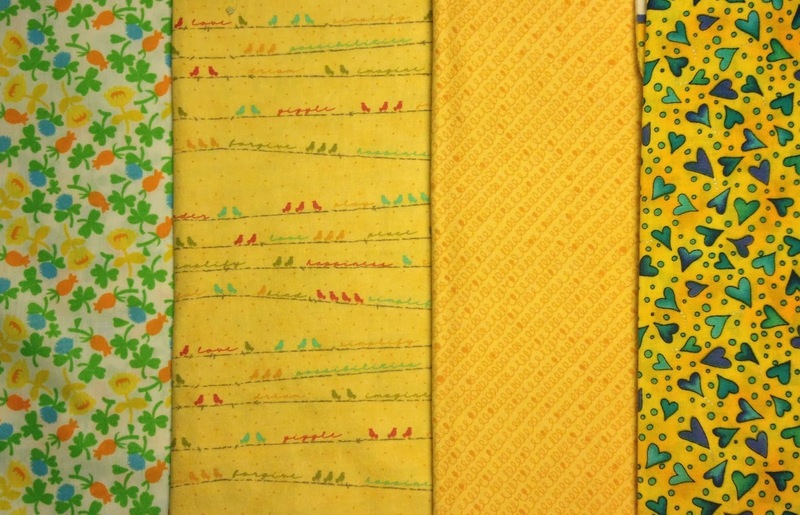 I go with small prints that pick up lots of colors to bring the colors in the quilt together. For me, as I look at fabric bolts or fabric samples I can usually tell the colors in the print will bring out lots of colors in the quilt. Sometimes I use the same fabric for binding, as I do for the backing, which creates a nice pulled together look on the back of the quilts. Backing fabric is often sold in widths of 104″ or 108″. 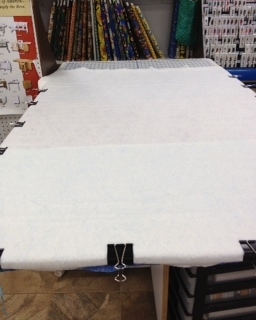 This makes it easier for the quilter, who won’t have to cut and sew large pieces of fabric together to make the back. So to stretch your fabric purchasing power, keep your eyes out for online and in brick & mortar stores for fabrics that fit those needs. Building fabric stash is fun. It seems that most quilters love quilting because of the fabric, or it becomes one of their favorite parts of the quilting process. There are large prints, small prints, blenders, tone on tone, text, geometrics, and solids. I have always been attracted to small prints. The example in the photo below is typical of the fabrics I would buy, as is the yellows below that, It’s one of those personal preferences. 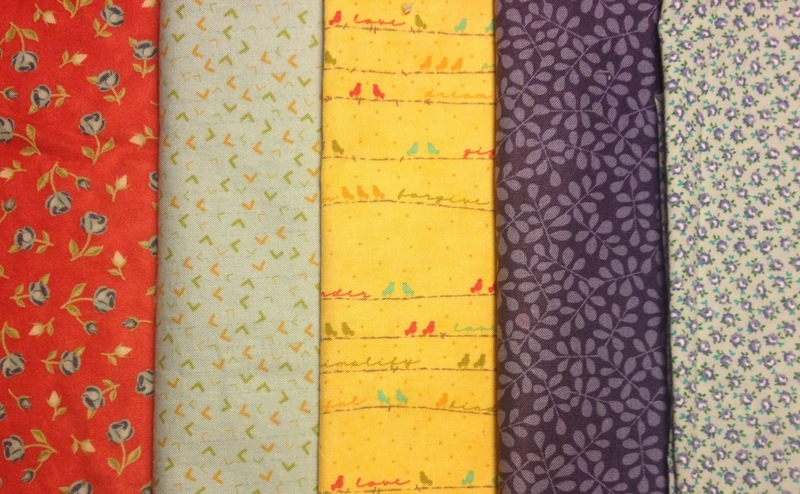 Now with modern quilting and vintage modern quilting, I am slowly beginning to buy more modern prints, and solids, because my eye is getting used to them. I still tend to shy away from geometrics and large prints. I am venturing into some large rose prints I recently discovered by Stephanie Ryan, a new designer at Moda, and Kate Sprain because I love flowers. I am experimenting with them as well as with some geometrics, and my old style is beginning to evolve into something new. 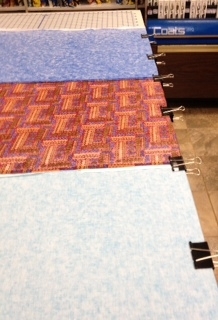 The other part of the fabric journey, that you’ll notice is that you will tend to purchase more of your favorite colors. In my case that is yellow, and purple as a close second. Those are my go-to colors, and over time I have filled in with the entire wheel of color choices. In part 5 of this series, I am going to focus on fabric stash building with backing fabrics, and part 6 with border and binding fabrics. I have a few strategies I’d like to share about how to build those, especially during fabric sales. A few posts ago in this series, I wrote about stretching your dollars. 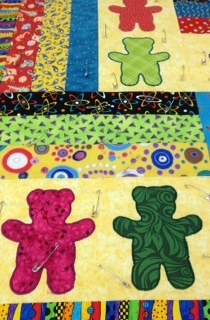 For example at http://www.connectingthreads.com/Quilting.cfm there is a great sale on batting right now. Of course I stocked up, and hope I won’t need anymore until this time next year. 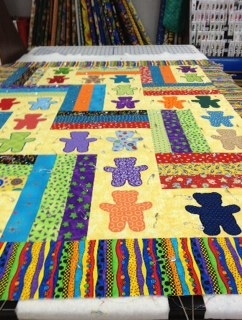 I finally basted my teddy bear quilt. I did the safety pin basting method, and it was so much less time consuming than hand basting. I usually hand baste, but now, whenever I can I safety pin baste, because it is a huge time saver. I’m not abandoning hand basting forever, because I have four WIP that are king size quilts, and I don’t think safety pin basting will keep the three layers smooth and taut when I quilt them together, and that is key for successful basting, quilting and finishing. 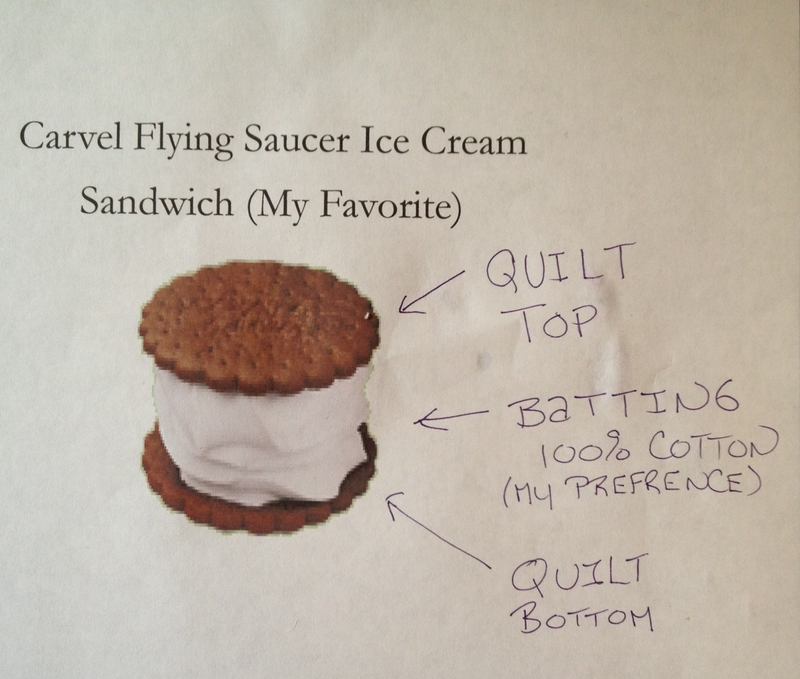 As some may know, a quilt is like a sandwich, and is made up of three layers; the top, the batting and the bottom. 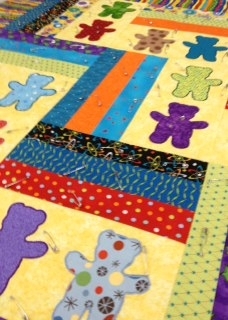 The three layers need to be firmly structured together for the quilting part of the process, and when finished, the safety pins, or hand basting thread are then removed. It is not a good thing when the three layers shift while quilting, because then you get an icky pocket or bump in the back, and it’s there forever, because ripping out all your quilting and going back to the basting stage takes an enormous amount of time, and is painstaking. (This is the voice of experience talking, so take my word for it). 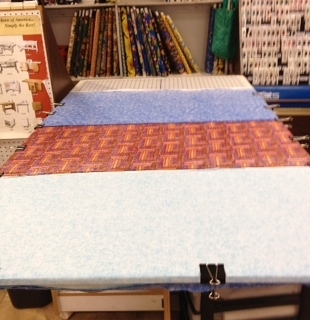 Make sure you’ve basted the three layers so they are completely smooth and flat, before you begin quilting. 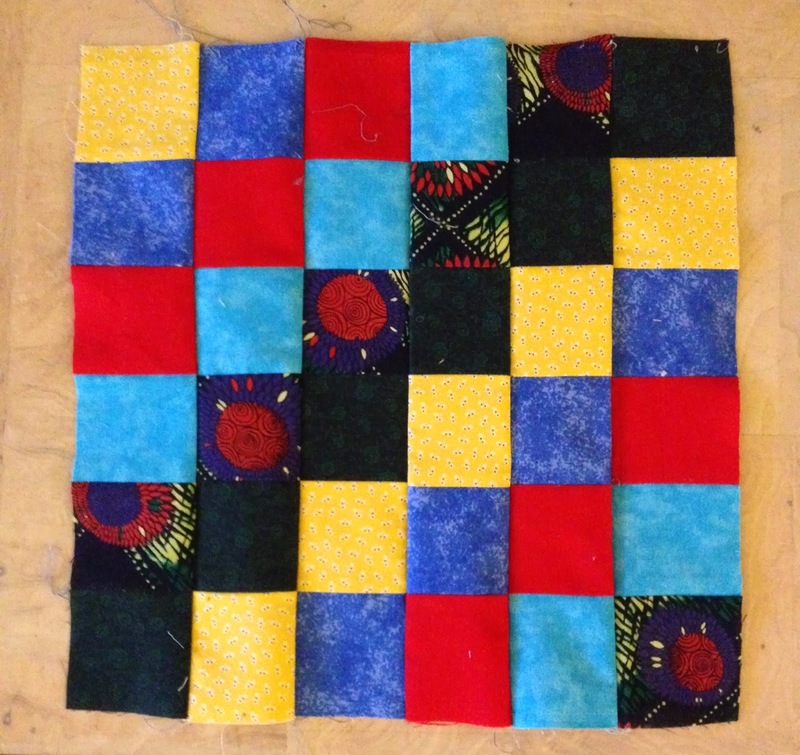 The goal is to have all three layers smooth and flat when you are finished quilting. Isn’t it easier to visualize a concept when fun food is involved? 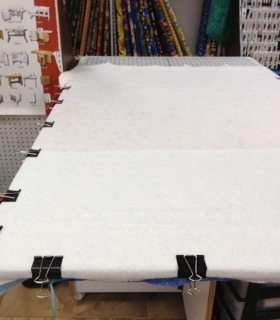 So I am using big clips to clamp down my bottom layer, or backing on a high and large table,courtesy of my favorite place to quilt, and hang out with other creative and interesting quilters, Pins and Needles in Mt. Kisco,NY. I have known the owners, a Mother -Daughter team, Deb and Lisa,for 15 years, and they are the nicest people and fabulous teachers. These clips can be bought at any store where they sell office supplies, such as Staples or Office Depot. 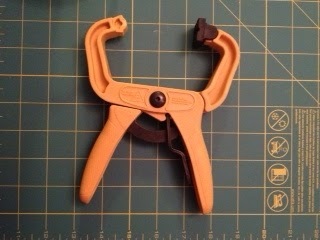 When I baste big king size quilts, I use these big yellow clamps which I bought at Home Depot. Here is the backing layer, clipped down. 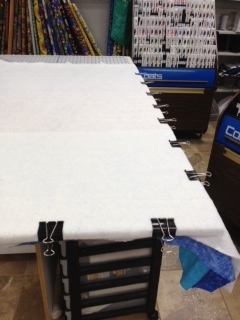 Because the end of the quilt doesn’t reach the end of the table, we used packing tape to secure that end down securely. I usually use 2″ blue painters tape which works really well too. The next step is to place the batting on top of the backing layer, and smooth it out from the middle to the edges. 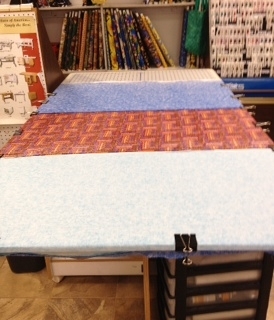 By the way, both the backing layer and the batting are at least 4″ larger in diameter than the quilt top. This is important because, not only will I need a little extra room to add my binding to the quilt after I’ve machine quilted the three layers, but the extra room provides insurance that the quilt top won’t overlap the batting and the backing layer. So I brought the clamps up carefully from the backing, to include the batting. I used Hobbs 100% cotton batting, which is my batting of choice. I like the feel and texture of it. I also like that all three layers are 100% cotton, and can be washed and dried easily in any washer and dryer. Then the top is added and smoothed out from the middle to the edges, but not clamped to the other two layers. If I were hand basting, I would have included all three layers in the clamps. I started safety pinning from the middle out in an X shape. Then from the middle, top to bottom and across the sides in a cross shape. Then I randomly filled in with safety pins in spaces where I thought the extra security would be useful so no bunching would happen on the back. And there you go!! Happy Quilting. We’ve made a lot of progress on the new sewing room, and one of my king size WIP. I am excited to show how both are shaping up later this week. For the last week I’ve been researching fabric prices, sales, deals and give-a-ways offered by brick & mortar and online stores. These are great ways for those of us who love to purchase fabric to stretch our dollars and not get into credit card debt. Below I’ve listed 27 URL’s of some of those stores, some of which I knew about and others that were highly recommended to me by other quilters and bloggers. I signed up for many new newsletters that will come to my e-mail inbox announcing to me about sales and deals. One to check out right now is http//:christaquilts.com because Christa is dissolving her online fabric store over the next 6 months in order to make more time for challenging herself in new areas of the quilting world. On another note, do you know how much willpower it took for me not to sneak in a fabric purchase? 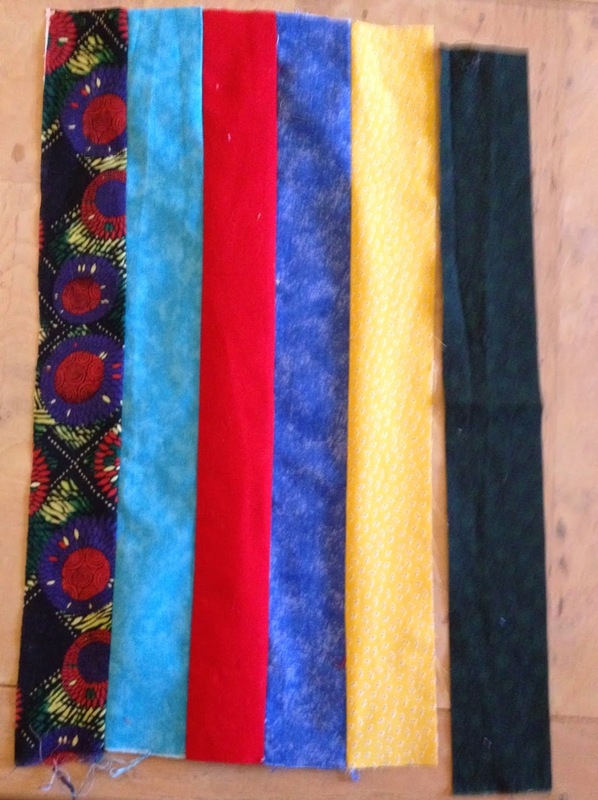 Well I will be honest here, I did make two fabric purchases, but I kept the total under $20. I couldn’t resist these little lambs or fabric with printed text of all different coffees. One other suggestion to save money on fabrics and notions; gift certificates. The holidays are coming, and family and friends are looking for suggestions, ask for gift certificates. www.cutsofcotton.com – Great choice of contemporary bundles, and solid fabrics. Can shop by designer or colors. Fairly priced. http://www.bearcreekquiltingcompany.com – Fair prices and a nicely priced clearance center. http://www.theclothparcel.com – Great fabric selection and prices. I will update this list every six months. If you have a suggestion, please leave it for me in the comments box. 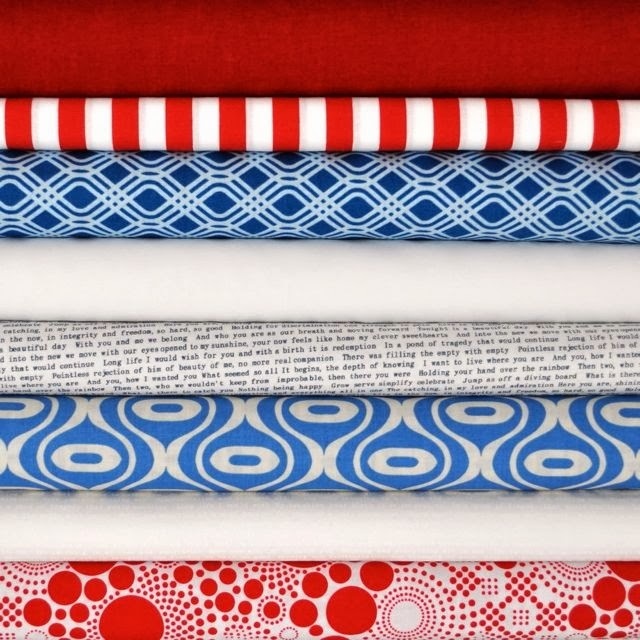 Congratulations to Lee, who is the lucky winner of the Patriotic Bundle from Cuts of Cotton!! Please contact me at acbeier71@gmail.com with your mailing address, so we can send the bundle to you. Later this week, I will post a full list of brick & mortar stores and online stores that offer great sales throughout the year. Monday I posted the first 10, in no particular order. If you sign up for their newsletter, their sales and specials will come right to your inbox. How easy is that? This is going to be a quick post. As I work on this series, I have a good list of brick & mortar stores and online shops that offer great selections and offer great sales. The list will grow longer by the end of the month, so keep checking back. I will also provide an update every six months. If you subscribe to their newsletter, they will send you information about their sales, fabrics clubs and other specials. It’s great to have such good news come right to your mailbox. Tomorrow morning I will announce the winner of the Patriotic Bundle, thanks to my sponsor, Cuts of Cotton. It’s open until midnight tonight. Just leave a comment on my box, and tell me what your favorite color is. I am really happy I joined the Modern Quilt Guild of Hudson Valley at the beginning of this summer. The members are terrific, fun, kind and are challenging me. I am loving Modern Quilting,and learning so much. The contemporary fabrics and quilt designs are challenging my thought process, and giving me so many new ideas for things I want to make. Then I realized I needed six strips. It’s a good thing I noticed that before doing the next step, which was to sew the long sides together, right sides together, creating a tube. So I added some green. 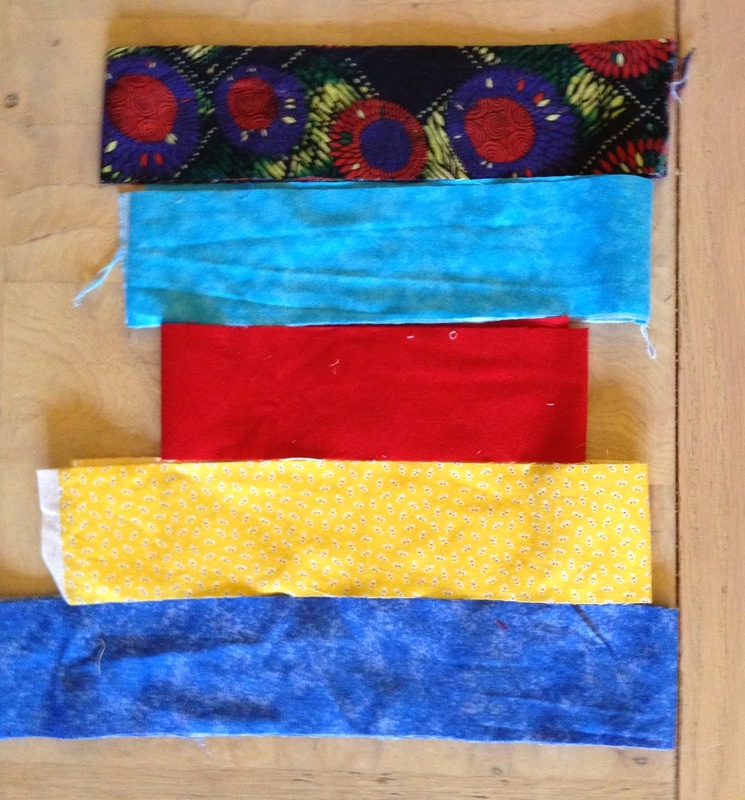 After I sewed the tube, I cut it into 6, 2 1/2″ units, and open them carefully with a seam ripper. Then I sewed all six strips together to make the postage stamp block. And, the block came out looking good. There is a tutorial on uTube, and I will post that in case anyone wants to try it. On Saturday, it will be in the mail on it’s way to become a beautiful quilt. 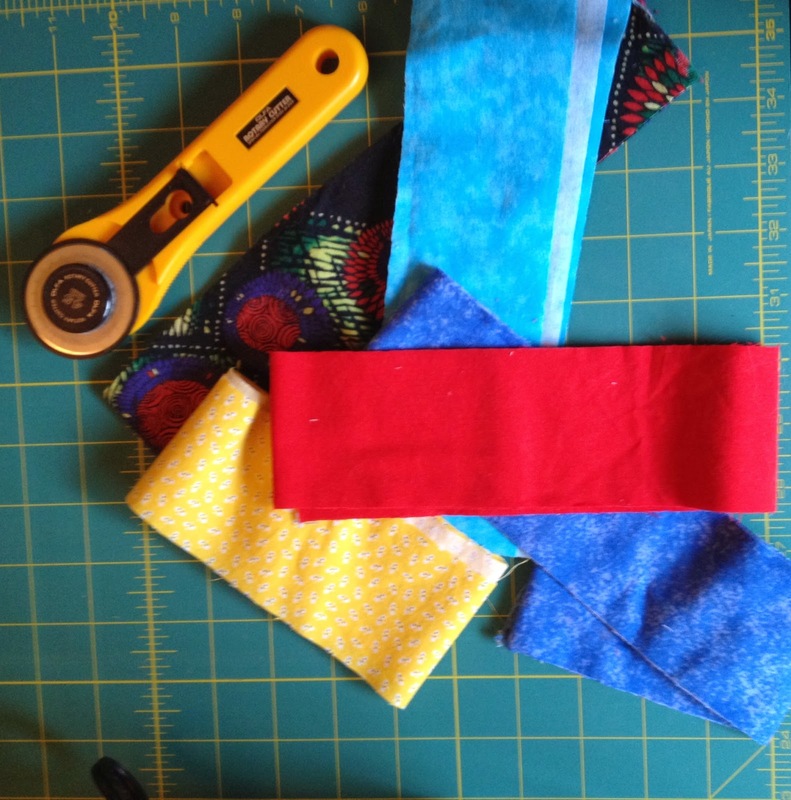 On Monday I will post Part 2 of Building Your Fabric Stash Without Breaking Your Budget. And I think we have a special fabric give-a-way planned with Cuts of Cotton in honor of Veteran’s Day. Have a great weekend! !